St David’s Hall will be transformed into a Mexican dance hall on Wednesday 8 July as the Ballet Folklórico de México visits the UK for the first time in 20 years. The folkloric ballet ensemble based in Mexico City was first established in 1952, and for the last six decades has delighted audiences with their vibrant rhythms, colourful costumes and merry performances. And now they are set to captivate a Cardiff crowd at the National Concert Hall of Wales with a range of dances that transcend language and race, whilst demonstrating Mexico’s richly diverse culture and heritage. 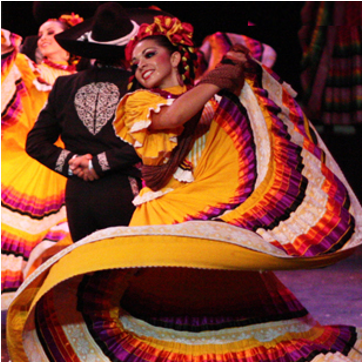 At their inception the Ballet Folklórico de México consisted of just eight performers. Yet, the ensemble quickly grew to 50 by the end of the decade and officially represented Mexico at the 1959 Pan American Games in Chicago. Since then the ensemble has gone from strength to strength combining fan-like skirt movements and syncopated foot stamping to sweet tones and stunning strings. Sample a taste of the joyous Mexican lifestyle at St David’s Hall! Tickets are priced £10, £12.50 and £15. A Family Ticket is also available for £20 for 4 people.